Robotic Vacuum technology enabled humans to clean their houses without the need of even lifting a finger. Requiring just a quick setting and occasional maintenance, robotic vacuums work like a charm and clean the house even when nobody is home. Investing in a robotic vacuum is a good investment as it lightens your workload and picks everything from debris to pert hair. Getting a robotic vacuum enables to spend spare time restingor on a hobby instead of cleaning your carpet and floor. Choosing best robotic vacuum is a tedious task and we have maintained few best robotic vacuums with latest features to help you select the one suited for you keeping affordability and convenience in mind. Eufy Robovac 11 is able to clean your house with just click of a button. It comes with versatile cleaning modes and low-profile design helps to clean every cornet especially under tables and furniture. Eufy Robovac 11 is integrated with High Capacity Li-ion battery that delivers strong suction power that lasts about 1.5 hours. It contains three point cleaning system technology that holds side-brushes, rolling brush as well as powerful suction that ensures a detailed and thorough cleaning. Due to its thinner design, Eufy Robovac 11 eliminates hidden dirt by sliding under furniture more easily as compared with other models. 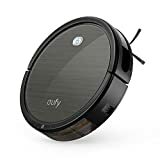 Eufy Robovac 11 does not require any use of hands while climbing over rugs, avoids falling over edges as well as rolls over uneven floor itself. Eufy Robovac 11is considered one of best robotic vacuums and is priced at $315.97. IRobot Roomba 960 provides premium performance by multi-room coverage. It contains power-lifting suction that delivers 5 times of air power so that it gets great pick-up performance. This robotic vacuum has patented IAdapt 2.0 Navigation along with vSLAM technology that allows IRobot Roomba 960 to map its surroundings and clean the entire level of the house. The three-stage cleaning system of IRobot Roomba 960 loosens, lifts as well as suctions dirt, dust as well as pet hair. Cleaning of the entire house is possible using iAdapt 2.0 Navigation with Visual Localization. Its cliff-detect sensors prevent the robot from falling down the stairs as well as from tumbling over drop-offs. Its Dual Multi-Surface Rubber Brushes adjust as well as flex instantly to stay in contact with a floor. With high-efficiency, it captures allergens, pollens as well as dirt even if it is as small as 10 microns. IRobot Roomba 960 is priced at $453.74. IRobot Roomba 890 is ideal for pet hair and provides advanced performance while connected to WiFi. Roomba 980 easily navigates from one room to another and cleans the entire level of the house, recharges and resumes until the job is done. Considered one of the best robotic vacuums in a market, Roomba 890 features patented Dirt Detect sensors that allow the Roomba to work hard on some areas of dirt as well as high-traffic zones of the house. IRobot Roomba 890 comes with Dual Multi-Surface Rubber Brushes that adjust easily and stay in contact with the floor. It features premium three-stage cleaning system that is able to loosen, lift as well as suction dirt, dust and pet hair. It requires very low maintenance and it is scheduled and set to clean on the go. Roomba 890 also features tangle-free brushes as well as a highly efficient filter. Delivering up to five times of air power, IRobot Roomba 890 is priced at $329.18. 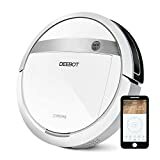 Ecovacs Deebot M88 promises to make life easier by featuring Smart Move technology that cleans the floors with great efficiency. An additional Max mode is also featured in an already powerful suction motor that helps achieve deep cleaning. Making it one of the best robotic vacuum using Ecovas app, Deebot is easily controlled, select cleaning mode, scheduled weekly or daily as well as status checked even if you are away from the house. Ecovacs Deebot M88 features four cleaning modes that help cleaning the floor efficiently. Optional Wet and Dry Mop features remove the need to use two devices and an integrated water reservoir dampens the cloth pad and mops as well as dries the floor on a single pass. Proven perfect for multi-surface use, Ecovacs Deebot M88 is priced at $323.99. It also features 90 minutes runtime as well as Auto Recharge technology. IRobot Roomba 690 features two main cleaning brushes that make it one of leading and best robotic vacuum. One brush is used to loosen the dirt while other is used to pick it and hence both brushes work together to remove dirt, debris as well as pet hair from the floor. It comes with patented three stages Cleaning System that features Dual Multi-Surface brushes, Edge-Sweeping brush as well as vacuum suction that attracts almost everything from small particles of dust to large pieces of debris from the floor as well as carpet. Roomba 690 features patented Dirt Detect Technology that recognizes concentrated areas of dirt, high-traffic zones of the house and ensures deep cleaning of the house. Its Edge-Sweeping brush is able to sweep debris hiding along the wall by its 27-degree angle. 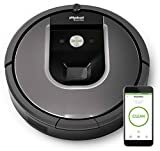 IRobot Roomba 690 is compatible with Amazon Alexa and Google Assistant and its sleek design make it one of the best robotic vacuums available in the market. 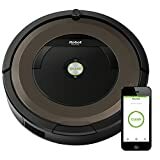 Roomba 690 is priced at $230.18. Its full suite of intelligent sensors guides robot under as well as around the furniture to ensures thorough and detailed cleaning of every corner of the house. Buying the best Vacuum Cleaner is a great step towards lessening of chores that could be taken care of easily thanks to advancement in technology. Various robotic vacuums offer various different features when it comes to cleaning levels as well as different prices. Some robotic cleaners are also able to connect to apps and can be monitored from outside the house so it all comes down to what features are a must have for you and what serves your purpose.